Israeli forces continued with systematic crimes in the occupied Palestinian territory (oPt), for the week of 26 April – 02 May, 2018. Israeli forces continued to directly target peaceful protests that did not pose any threat to the Israeli soldiers’ life. 4 Palestinian civilians, including a child, were killed on the fifth Friday of the March of Return and Breaking Siege. Israeli forces continued to use excessive lethal force against Palestinian civilians, who participated in peaceful demonstrations organized on the 42nd anniversary of the Earth Day, particularly in the Gaza Strip, which witnessed peaceful demonstrations along the eastern Gaza Strip border area, where ten thousands of defenseless Palestinian young men, women, children, and elderlies participated. On Friday, 20 April 2018, the Gaza Strip witnessed peaceful demonstrations where ten thousands of Palestinian civilians participated. Those non-violent demonstrations continued sporadically during the reporting period. As a result, 4 Palestinian civilians, including a child, were killed, so the death toll has increased to 40 Palestinian civilians, including 5 children and 2 journalists, since the beginning of the demonstrations of the March of Return and Breaking the Siege on 30 March 2018 in the Gaza Strip only. Moreover, two civilians were killed after the Israeli forces claimed they threw explosive devices at a military patrol but their families confirmed they were only civilians. Further, a child was killed while attempting to sneak into Israel. In the Gaza Strip as well during the reporting period, 389 Palestinian civilians, including 67 children, 8 women, 6 journalists and 4 paramedics, were wounded; condition of some of them was reported serious. In the West Bank, the Israeli forces wounded 10 Palestinian civilians, including 1 child, 1 paramedic and 1journalist, in separate incidents. The demonstrations witnessed an increase in the number of participants during this day particularly after 16:00 as their number was estimated at ten thousands of participants, including women, children, elderlies and entire families, in 5 main points where the March of Return demonstrations were set. According to the fieldworker’s eyewitnessing, at approximately 17:00, under a huge Palestinian flag and amidst the sound of Scouts’ drums, hundreds approached at a close range from the border fence in eastern Khan Younis, and the Israeli forces heavily targeted them with live fire and tear gas canisters. As a result, one of the civilians was killed while others were wounded. Moreover, dozens of women and civilians shouting national slogans were hit with tear gas canisters, noting they were standing on the sand barriers which are around 260 meters away from the border fence. The Israeli snipers deliberately and selectively opened fire at the participants in the peaceful demonstrations which included thousands of civilians in 5 areas in the eastern Gaza Strip. As a result, 3 civilians were killed and a child succumbed to his wounds the next day while 373 others, including 65 children, 8 women, 6 journalists and 4 paramedics, were wounded only on the abovementioned Friday, noting that most injuries occur in the demonstration area that is around 30-300 meters away from the border fence while many injuries among the demonstrators were reported along the border fence, east of Gaza and Jabalia. The demonstrations were as always fully peaceful, and PCHR’s fieldworkers did not witness weapons or armed persons even dressed in civilian clothes among the demonstrators, who were thousands of elderlies, women, children and entire families. Those demonstrators moved forward until in certain instances, particularly in eastern Gaza City, Jabalia and Khan Younis, reached the border fence raising flags, chanting slogans and national songs, flying kites in high and burning tires. Meanwile in other demonstrations, there were folklore, sportive and Scout performances in addition to women’s gatherings. However, the demonstrators were under the Israeli fire. PCHR fieldworkers’ observations undoubtedly refute the Israeli government and some media’s claims that children are used as human shields by the demonstrators. This refusal was based on the totally peaceful nature of the demonstrations, participation of entire families, including their children, and some women and children’s offering water for the demonstrators and raising flags with no influence from any political party encouraging them to do so. The Israeli forces widely used bursts of tear gas canisters targeting the center of the demonstrations and the demonstrators near the border fence. As a result, hundreds, including PCHR’s fieldworkers who were documenting the incidents, suffered tear gas inhalation and seizures; some of them were transferred to hospitals as a number of them still receive medical treatment. The Israeli forces twice fired many tear gas canisters which fell near the field clinic in eastern al-Bureij refugee camp, noting the clinic is 450 meters away from the border fence. As a result, the medical crews suffered tear gas inhalation and their work was disrupted. Moreover, 5 paramedics were directly hit with tear gas canisters while on duty to rescue and evacuate those wounded in the demonstrations in eastern Gaza, Khan Younis and al-Bureij. Journalists were again directly targeted resulting in the injury of 6 journalists with direct live bullets or tear gas canisters though most of them were wearing their PRESS-marked vests. PCHR’s investigations point out that 2 of those killed were directly shot to the head and neck while the third was shot to the abdomen in addition to the other injuries that were mainly in the head, neck, back, chest, abdomen and limbs. Moreover, there are 13 civilians in critical condition, including a 15-year-old child from Khan Younis hit with a live bullet to the head, portending that the death toll would rise in any moment. PCHR’s fieldworkers noticed that the Israeli shooting and teargasing at the protesters intensified randomly when dozens of demonstrators could approach or reach in some instances the border fence or even managed to pull parts of the second barbed wires placed inside the Palestinian territories around 50 meters away from the main border fence. As a result, many injuries were reported particularly in eastern Khan Younis, Gaza and Jabalia. In addition to the abovementioned, on 29 April 2018, Israeli forces stationed along the border fence between the Gaza Strip and Israel, east of al-Qararah village, northeast of Khan Younis shot dead 2 Palestinian civilians who attempted to sneak via the border fence. On his Facebook page, the Spokesperson of the Israeli forces declared that 2 persons crossed the security fence in the southern Gaza Strip, claiming they “threw explosive devices at a military patrol, so the Israeli soldiers in response opened fire at the two saboteurs and killed them.” However, the family of both civilians says that they were only civilians. On the same day, the Israeli soldiers opened fire at Yousif Abu Jazar (16) from Bader refugee camp, west of Rafah City in the southern Gaza Strip after he managed to cross the border fence between the Gaza Strip and Israel. They arrested him and his friend who was later released. On the same day, a civilian was wounded to the left leg when the Israeli forces moved into the area opposite to the March of Return encampments, east of Khuza’ah village, southeast of Khuza’ah, southeast of Khan Younis in the southern Gaza Strip amidst shooting at the sit-in yard there. As part of targeting fishermen in the sea, the Israeli forces continued to escalate their attacks against fishermen in the Gaza Sea, indicating to the on-going Israeli policy of targeting their livelihoods. During the reporting period, PCHR’s fieldworkers monitored 3 shooting incidents in north-western Beit Lahia in the northern Gaza Strip. As part of the Israeli airstrikes, on 27 April 2018, Israeli warplanes launched 2 missiles at boats prepared to receive ships for breaking the siege in the Gaza Seaport. As a result, the boats sustained severe damage while no casualties were reported. On the same day, the Israeli warplanes launched 4 missiles at a military site belonging to the Palestinian armed groups in Western Deir al-Balah in the central Gaza Strip. The airstrike came after the Israeli gunboats fired 6 shells at the above-mentioned site. Meanwhile, no casualties were reported, but the site sustained damage. As part of targeting the border areas, on 26 April 2018, Israeli forces stationed along the border fence between the Gaza Strip and Israel, east of Deir al-Balah in the central Gaza Strip, opened fire at the Palestinian shepherds. However, no casualties were reported. On 27 April 2018, Israeli soldiers stationed along the border fence, east of Gaza Valley Village (Johr al-Deek) in the central Gaza Strip opened fire and fired canisters in the vicinity of the landfill. However, no casualties were reported. On 29 April 2018, Israeli soldiers stationed along the border fence, east of al-Maghazi in the central Gaza Strip opened fire at the farmers’ lands. The shooting recurred on 30 April 2018 in the eastern side of the area and eastern Deir al-Balah. In the West Bank, on 26 April 2018, two Palestinian civilians were wounded when Israeli forces stationed inside the military watchtower at the southern entrance to Halhoul, north of Hebron, opened fire at a Fiat Punto Car without any prior warning. On the same day, a Palestinian civilian was wounded to his right hand with a bullet when the Israeli forces moved into al-Dheishah refugee camp, south of Bethlehem, to carry out an arrest campaign and some civilians protested against them. On 27 April 2018, a civilian, who was arrested, and paramedic were wounded when an Israeli military force moved into Kabsah intersection between the villages of al-‘Izar’iyah and Abu Dis, east of occupied East Jerusalem, and dozens of youngsters protested near the area. On 30 April 2018, a 21-year-old civilian was wounded from Balata refugee camp with a rubber bullet to the right foot during a protest against the Israeli soldiers who moved into Nablus to carry out an arrest campaign. On the same day, a child was wounded with a rubber bullet to the foot and then arrested when the Israeli forces moved into Jabe’a village, south of Jenin, to carry out an arrest campaign. In addition to the abovementioned injuries, during the reporting period, 2 Palestinian civilians were wounded after Israeli forces opened fire at them and fired tear gas canisters directly during peaceful protests and stone-throwing at the Israeli soldiers stationed at the entrances to the Palestinian communities in the West Bank. Those demonstrations came in the light of demonstrations organized by Palestinian civilians in protest at Trump’s decision to recognize Jerusalem as the capital of Israel, the Israeli forces’ ongoing settlement crimes, confiscation of Palestinian lands, and Israeli forces’ crimes against the peaceful demonstrations organized by the Palestinians along the eastern borders of the Gaza Strip. As part of the Israeli settlement expansion and house demolition notices and demolitions, on 27 April 2018, Eyad Ramadan self-demolished a car parking he owns in Wadi al-Helwa neighborhood in Silwan village, south of occupied East Jerusalem, to implement the Israeli Municipality’s decision. Eyad said that he self-demolished the parking to implement the Israeli Municipality’s decision and avoid paying the high fine and demolition costs he will forced to pay under the pretext of non-licensing. Eyad also said that the Israeli Municipality issued 3 months before a demolition decision against his parking under the pretext of non-licensing and he attempted to delay the decision but in vain. On 29 April 2018, the Israeli Nature Authority conducted excavation works in Bab al-Rahma Cemetery adjacent to al-Aqsa Mosque in occupied East Jerusalem’s Old City, under the Israeli forces’ protection. The Israeli Nature Authority crews excavate and exhume many graves and damaged their gravestones to fix steel poles as part of the Israeli plans in the cemetery lands. On 01 May 2018, the Israeli municipality bulldozers demolished a building belonging to Jamal ‘Alian in al-Issawiyah village, northeast of occupied East Jerusalem, under the pretext of non-licensing. The abovementioned civilian said that the building was established 5 years ago and the municipality issued a decision to demolish it 2 years after it was built. However, the decision was delayed and frozen many times until a fine of 230 thousands shekels was imposed. The first floor of the 3-storey building includes a pizza shop, spices shop, and dry-clean” while the 2 other floors include 4 apartments of 200 square meters sheltering 4 families of 17 individuals, including 7 children. As part of the settlement expansion and house demolitions and demolition notices, on 28 April 2018, the Israeli authorities notified 2 Palestinian families of seizing vacant areas of their lands in al-Khadir village, south of Bethlehem. Ahmed Salah, Coordinator of the Committee against the Wall and Settlements in al-Khadir village, said that the Israeli authorities notified to seize 42 dunums belonging to Salah and Subaieh Families for security purposes. He also said that this measure coincided with surveying lands in Um Rukba area by the Israeli Civil Administration officers, claiming that they want to establish a large square and build a road leading to Solomon’s Pools. On 02 May 2018, Israeli forces backed by military vehicles and bulldozers and accompanied with vehicles belonging to the Civil Administration moved into Masafer Yatta, south of Hebron, classified by the Israeli forces as military training areas. The vehicles demolished many dwellings in Kherbet al-Fakhit and other facilities in Kherbet Janbah. Kherbet al-Halawah, Kherbet al-Markaz, and Kherbet al-Fakhit. The demolition targeted 5 residential rooms, 5 sheep barns while 4 solar cells were confiscated. As part of the Israeli settlers’ attacks against Palestinian civilians and property, on 27 April 2018, a group of Israeli settlers from “Yitzhar “settlement attacked the stone pits area, northwest of ‘Oreef village, south of Nablus. The Israeli settlers wrote hostile slogans against Arabs and Muslims on the vehicles and punctured with sharp tools the tires of 2 vehicles belonging to Sakhir Company. On the same day, a group of Israeli settlers from “Yitzhar “settlement attacked a plot of land belonging to Jamila Abed al-Rahman Shehada, from ‘Oreef village, south of Nablus. The settlers cut about 12 olive trees with automatic saws. On 29 April 2018, a group of Israeli settlers from “Eli Zahav” settlement levelled Palestinian civilians’ lands belonging to Kafur al-Deek Municipality, west of Salfit, in order to expand the above-mentioned settlement. While covering the leveling, the Israeli settlers attacked the reporter of Ma’an News Agency, ‘Ohoud ‘Aqail al-Khafsh (38), from Merda village, north of Salif. The settlers beat her to prevent her from taking photos and attempted confiscate her press equipment. As a result, ‘Ohoud sustained bruises to her hands and feet. At approximately 14:00 on Thursday, 26 April 2018, dozens of Palestinian protestors gathered along the border fence between the Gaza Strip and Israel, east of al-Buraij in the central Gaza Strip, within the activities of the March of Return organized by the Supreme National Authority for the Great March of Return and Breaking Siege in the Gaza Strip. They threw stones at Israeli soldiers stationed behind sand barriers along the border fence. The soldiers fired live bullets and tear gas canisters at them. The clashes continued until the evening hours. As a result, 3 civilians, including a child were wounded and then transferred via ambulances belonging to the Palestine Red Crescent Society (PRCS) to al-Aqsa Hospital in Deir al-Balah. Doctors classified their injury as moderate. Mohammed Amin Ahmed al-Moqayad (21) from Sheikh Redwan neighborhood was hit with a bullet to the head. Khalil Na’im Mustafa ‘Atallah (22) from Shahabah neighborhood was hit with a bullet to the neck and shrapnel to the abdomen. In addition, 155 civilians, including 25 children, 4 women, 2 journalists and a paramedic, were wounded. One hundred and thirty four of them were hit with live bullets, 3 civilians were hit with rubber bullets and 18 others were directly hit with tear gas canisters. Abdul Rahman Hani al-Kahlout (22), a freelance photojournalist was hit with a live bullet to the right foot. Hashem Eyad Hamadah (23), a photojournalist at Hala Palestine News was hit with a tear gas canister to the head. Mazen Jebril Hasnah, a paramedic at the Military Medical Services, was hit with 2 live bullets to the legs. Doctors classified his injury as serious as he is so far in the ICU. At approximately 09:00 on the same Friday, Palestinian protestors swarmed to the camps established by the Supreme National Authority for the Great March of Return and Breaking Siege 700 meters away from the border fence between the Gaza Strip and Israel, east of al-Buraij in the central Gaza Strip. Following the Friday prayer, the number of participants increased when thousands of civilians, including women, children and men, arrived at the area. Hundreds of them approached the border fence, set fire to tires and threw stones at Israeli soldiers stationed behind sand barriers 30 meters away from the border fence. The soldiers sporadically fired live bullets and tear gas canisters at them and the protestors gathered at distances of more than 300 meters. The clashes continued until approximately 21:00 on the same day. As a result, 37 protestors, including 7 children and a woman, were wounded. Thirty six of them were hit with live bullets while one civilian was directly hit with a tear gas canister. They were transferred via PRCS ambulances to al-Aqsa Hospital in Deir al-Balah. Doctors classified the injuries of 3 civilians as serious and transferred them to al-Shifa Hospital in Gaza City. In the evening, the Israeli soldiers fired tear gas canisters in the vicinity of the encampments and field clinics belonging to the Ministry of Health. As a result, the medical crews and dozens of the protestors suffered tear gas inhalation. On Friday morning, 27 April 2018, hundreds of Palestinians swarmed to the sit-in yard in the March of Return encampments established by the Supreme National Authority for the Great March of Return and Breaking, east of Khuza’ah village, east of Khan Yunis. The encampments are surrounded with the border fence between the Gaza Strip and Israel from the eastern and northern side on distances averaged between 250-500 meters. Following the Friday prayer, at approximately 13:30, the numbers of the protestors increased, reaching to hundred thousands of men, elderlies, women and children. They spread inside and outside the encampments yards, raised flags, and chanted slogans and national songs as dozens of them approached the border fence, set fire to tires and managed to pull parts of the second barbed wires placed inside the Palestinian territories around 50-70 meters away from the main border fence, attempting to threw stones at Israeli forces. According to observations by PCHR’s fieldworkers, the Israeli forces stationed on huge sand barriers and hills and inside military vehicles, 30-50 meters away from the border fence continued deliberately firing live bullets and tear gas canisters at the protestors. PCHR’s fieldworkers noticed that the demonstrations were as always fully peaceful, and PCHR’s fieldworkers did not witness weapons or armed persons even dressed in civilian clothes among the demonstrators. The numbers of the demonstrators, reaching to thousands of men, elderlies, women and children within entire families of different ages, increased, reaching its peak at approximately 16:00 in the evening. They raised Palestinian flags, chanted slogans and national songs, flew kites and set fire to tires. At approximately 17:00, under a huge Palestinian flag and amidst the sound of Scouts’ drums, hundreds approached at a close range from the border fence and the Israeli forces heavily targeted them with live fire and tear gas canisters. As a result, one of the civilians was killed while others were wounded. Moreover, dozens of women and civilians shouting national slogans were hit with tear gas canisters, noting they were standing on the sand barriers which are around 260 meters away from the border fence. The Israeli forces widely used bursts of tear gas canisters targeting the center of the demonstrations and the demonstrators near the border fence. The Ministry of Health moved the Field clinic from its previous location to a new one far away from the encampments after the Israeli forces targeted the mentioned clinic with tear gas canisters in the 2 previous Fridays. The Israeli shooting sporadically and deliberately continued until 20:00. As a result, Abdul Salam ‘Eid Zuhdi Baker (33) from Khan Yunis was killed after being hit with a live bullet that amputated part of his right hand finger and settled under the chest causing internal severe bleeding. Baker was taking photos of the incidents by his J7 cell phone while he was 100 meters away from the border fence, east of Khuza’ah. Moreover, 64 civilians, including 13 children, 2 women, a journalist and 3 volunteer paramedics, were wounded. Eighteen of them were hit with live bullets, 45 were directly hit with tear gas canisters and one civilian was hit with a rubber bullet. all the wounded were taken to the field clinics in the encampments and then transferred to Nasser, Gaza European and Algerian Hospitals in the city. Doctors classified their injury of 2 of them as serious. At approximately 04:30 on 28 April 2018, ‘Azzam Helal Riyad ‘Ouweidah (15) succumbed to wounds he sustained after being hit with a tear gas canister to the back of his head at approximately 18:10 on Friday while he was 100 meters away from the border fence, east of Khuza’ah. The tear gas canister caused a 2.5-centemeter hole in ‘Ouweidah’s head and brain laceration and fractures in the head bones. Moreover, Hundreds of civilians suffered tear gas inhalation and seizures as dozens of them were transferred to hospitals. Nabil Eyad Nabil Darabaih (21), a photojournalist at Quds News from al-Nasser neighborhood in Gaza City, was hit with a tear gas canister to the head. Nihad Fou’ad Ibrahim Abu Ghalyoun (33), a journalist at Forsan Alerada Radio, was hit with a tear gas canister to the back. At approximately 14:00 on the same Friday, dozens of Palestinian civilians, including women, children and elderlies within entire families swarmed to the March of Return encampments established by the Supreme National Authority for the Great March of Return and Breaking Siege, east of al-Shawkah village, east of Rafah after they moved the camps to Jaker Street, 300 meters away from the border fence between the Gaza Strip and Israel. They raised the Palestinian flags and chanted national slogans as some of them approached the first border fence, which is placed inside the Palestinian territories around 50-70 meters away from the main border fence. They also managed to pull parts of it and set fire to tires, flew kites and threw stones at the Israeli soldiers. The soldier fired live bullets and tear gas canisters. The clashes continued until approximately 19:00 on the same day. As a result, 33 civilians, including 5 children and a journalist were wounded. Twenty eight of them were hit with live bullets and its shrapnel, 3 civilians were hit with rubber bullets and 2 were directly hit with tear gas canisters, including photojournalist Abdul Rahim Mohammed Deeb al-Khatib (40). 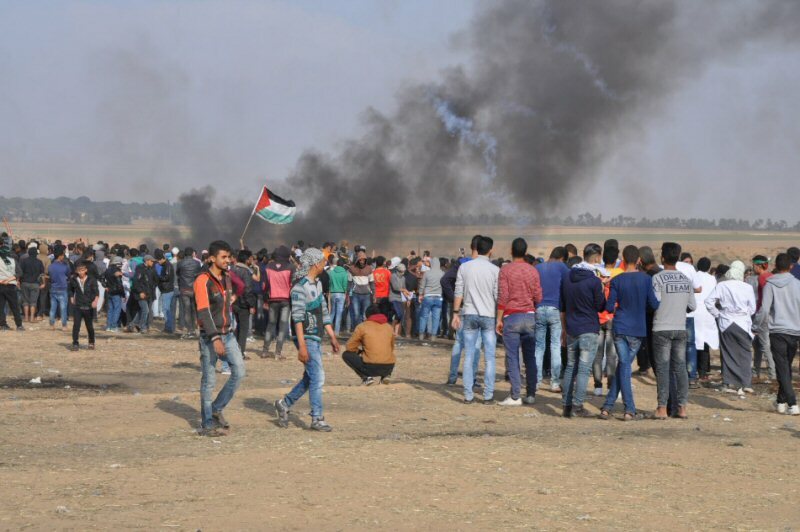 On Saturday afternoon, 28 April 2018, dozens of Palestinian civilians gathered in eastern Malakah intersection, east of al-Zaitoun neighborhood, east of Gaza City, to participate in the activities of the “Great March of Return and Breaking the Siege.” The protestors threw stones at Israeli forces stationed behind the border fence between the Gaza Strip and Israel. The soldiers fired live bullets and tear gas canisters at them. In the evening, a 24-year-old civilian from al-Sheja’eya neighborhood was hit with a live bullet to the left foot. At approximately 17:00 on Sunday, 29 April 2018, Israeli forces stationed behind the border fence between the Gaza Strip and Israel, east and northeast of the demonstration encampments, east of Khuza’ah village, east of Khan Yunis in the southern Gaza Strip, fired live bullets and tear gas canisters at protestors who were in the area. Some of the protestors attempted to approach the border fence. The shooting continued sporadically for 2 hours. As a result, a civilian was hit with a live bullet to the right thigh and transferred to the Gaza European Hospital to receive medical treatment. At approximately 14:00 on Monday, 30 April 2018, dozens of Palestinian civilians gathered near the border fence between the Gaza Strip and Israel, east of al-Buraij in the central Gaza Strip to participate in “The Great March of Return and Breaking the Siege” activities organized by the Supreme National Authority for the Great March of Return and Breaking Siege in the Gaza Strip. They threw stones at Israeli soldiers stationed behind sand barriers along the abovementioned border fence. The soldier soldiers fired live bullets and tear gas canisters at them. The clashes continued until the evening. As a result, a civilian was hit with a live bullet to the lower limbs. At approximately 17:00 on the same Monday, Israeli forces stationed behind the border fence between the Gaza Strip and Israel, north and northeast of the demonstration camp, east of Khuza’ah village, east of Khan Yunis in the southern Gaza Strip, fired live bullets and tear gas canisters at the protestors who were in the area. Some of the protestors attempted to approach the border fence. The shooting continued sporadically for 2 hours. As a result, a civilian was hit with a live bullet to the lower limbs and doctors classified his injury as moderate. At approximately 19:00 on the same Monday, dozens of Palestinian civilians gathered in the eastern side of Malakah intersection, east of al-Zaitoun neighborhood, east of Gaza city to participate in the activities of “The Great March of Return and Breaking Siege.” The protestors threw stones at Israeli soldiers stationed behind border fence between the Gaza Strip and Israel. The soldiers sporadically fired live bullets and tear gas canisters at them. In the evening, a 25-year-old civilian from al-Sheja’eya neighborhood was hit with a live bullet to the left foot. At approximately14:50 on Tuesday, 01 May 2018, Israeli forces stationed along the border fence between the Gaza Strip and Israel, north of Buret Abu Samra, north of Beit Lahia in the northern Gaza Strip, opened fire at Palestinian civilians who were near the border fence. As a result, a 27-year-old civilian from Jabalia was hit with a live bullet to the left thigh and doctors classified his injury as moderate. At approximately 17:30 on the same Tuesday, Israeli forces stationed behind a sand barrier which is 50 meters away to the eastern side of the border fence between the Gaza Strip and Israel, east of Abu Safiya Hill, northeast of Jabalia in the northern Gaza Strip, fired live and rubber bullets and tear gas canisters at dozens of civilians who were 50-150 meters to the west of the border fence. The protestors set fire to tires and threw stones at Israeli soldiers from far distances. As a result of the clashes, a 24-year-old civilian was hit with a live bullet to the left leg and doctors classified his injury as moderate. At approximately 12:00 on Wednesday, 02 May 2018, Israeli forces stationed behind the border fence between the Gaza Strip, fired live bullets at the Return encampments, east of al-Shawkah village, east of Rafah in the southern Gaza Strip. As a result, a crane driver was hit with a live bullet to the upper limbs while he was working on moving containers inside the camp. He was transferred to Abu Yusuf al-Najjar Hospital in Rafah and doctors classified his injury as moderate. At approximately 17:30, on the same Wednesday, Israeli forces stationed behind a sand barrier 50 meters away to the eastern side of the border fence between the Gaza Strip and Israel, east of Abu Safiya Hill, northeast of Jabalia in the northern Gaza Strip, fired live and rubber bullets and tear gas canisters at dozens of civilians who were 50-150 meters away to the western side of the border fence. The protestors set fire to tires and threw stones at the Israeli soldiers from far distances. As a result of the clashes, a 21-year-old civilian was hit with a live bullet to the left thigh and a 15-year-old civilian was hit with a live bullet to the thighs and testicles. One of the wounded civilians was transferred to the Return of March clinic belonging to the General Union Committee and doctors classified his injury as moderate while the other wounded civilian was transferred to the Indonesian Hospital and doctors classified his injury as serious and he is staying at the ICU because he severe bleeding in the thighs. At approximately 18:00 on the same Wednesday, Israeli forces stationed behind the border fence between the Gaza Strip and Israel, east and northeast of the Return of March encampments, east of Khuza’ah village, east of Khan Yunis in the southern Gaza Strip, fired live bullets and tear gas canisters at the protestors who gathered in the area. Some of the protestors approached the border fence. The shooting continued sporadically for 2 hours. As a result, 3 civilians were hit with live bullets shrapnel to the limbs. They were transferred to the Gaza European Hospital and doctors classified their injury as moderate. During sporadic hours of the day, young men gathered from time to time near the border fence, which is 250 meters into the north of the camp, and attempted to throw stones at the Israeli forces. They also managed to pull the security fence that the Israeli forces replaced inside the Palestinian territory, 70 meters away from the main border fence. The Israeli forces continued targeting the protestors by firing live bullets and tear gas canisters at them. Following the Friday prayer at approximately 13:30 on 27 April 2018, a group of Palestinian civilians moved from Kufor Qaddoum village, northeast of Qalqiliyah into the eastern entrance to the village, which has been closed for 15 years in favor of the entrance to “Kedumim” settlement established on the village lands. The protestors chanted national slogans demanding to end occupation, condemning the U.S President Donald Trump’s decision to recognize Jerusalem as the capital Israel and condemning the Israeli forces’ crimes against Palestinian protestors at the eastern border of the Gaza Strip within “The Great March of Return and Breaking the Siege” activities. The protestors threw stones at Israeli soldiers stationed behind sand barriers. The soldiers fired live and rubber bullets, sound bombs and tear gas canisters at them. As a result, a 35-year-old child was hit with a rubber bullet to the right hand. At approximately 15:30 on Saturday, 28 April 2018, a group of Palestinian civilians moved from Kufor Qaddoum village, northeast of Qalqiliyah into the eastern entrance to the village, which has been closed for 15 years in favor of the entrance to “Kedumim”settlement established on the village lands. The protestors chanted national slogans demanding to end occupation, condemning the U.S President Donald Trump’s decision to recognize Jerusalem as the capital Israel and condemning the Israeli forces’ crimes against Palestinian protestors at the eastern border of the Gaza Strip within “The Great March of Return and Breaking the Siege” activities. The protestors threw stones at Israeli soldiers stationed behind sand barriers. The soldiers fired live and rubber bullets, sound bombs and tear gas canisters at them. As a result, Walid Kamel Omer Barham (52) was hit with a rubber bullet to the skull causing a fracture to it and bleeding to the eye. It should be noted that Barham was working in his land near the demonstration area as he was wounded 10 meters away from it. He was transferred to the Istishari Arab Hospital in Nablus and doctors classified his injury as serious. On Friday, 27 April 2018, Eyad Ramadan self-demolished a car parking he owns in Wadi al-Helwa neighborhood in Silwan village, south of occupied East Jerusalem, to implement the Israeli Municipality decision. Eyad said that he self-demolished the parking to implement the Israeli Municipality decision and avoid paying demolition costs, under the pretext of non-licensing. Eyad also said that the Israeli Municipality issued before 3 months a demolition decision against his parking under the pretext of non-licensing and he attempted to delay the decision but in vain. The Israeli police raided his parking few days ago and ordered him to level it. They also gave him until 29 April 2018 to implement the decision or the Israeli Municipality vehicles will demolish the parking and he will pay the demolition costs in addition to a fine estimated at NIS 60,000. Eyad added that he built the parking because there was no other parking in the neighborhood and the Israeli Municipality and police usually issue fines against the residents’ vehicles if they park their vehicles in front of their houses. On Sunday, 29 April 2018, the Israeli Nature Authority conducted excavation works in Bab al-Rahma Cemetery, which is next to al-Aqsa Mosque in occupied East Jerusalem’s Old City, under the Israeli forces’ protection. The Israeli Nature Authority crews excavate and exhume many graves and damaged their gravestones to fix steel poles, upon the Israeli plans in the cemetery. Eyewitnesses said that the Israeli Nature Authority crews excavated in the vicinity of graves belonging to al-‘Abasi and al-A’war Families and damaged some gravestones to fix steel poles in Bab al-Rahma Cemetery known as “al-Salwanah Cemetery”, under the Israeli forces’ protection. The Israeli forces provide a fully protection to the Israeli Nature Authority crews and prevented anyone from approach. The eyewitnesses also said that the excavation works continued for the next day in order to surround some graves with iron fences, despite confronting them by the village’s residents and prevented them from conducting excavation works and exhuming graves in Bab al-Rahma Cemetery. The eyewitnesses added that the Israeli police prevented the residents from approach or access to the area and forcibly kept them away. A wrangle erupted between the soldiers and residents. Meanwhile, Khaled al-Zair was arrested and beaten by the Israeli forces before taking him to a detention facility. Mustafa Abu Zahra, head of the committee for the preservation of Islamic cemeteries in Jerusalem, refused to surround graves with iron fences, clarifying that the Israeli Nature Authority sprayed chemical materials at trees and grasses. The Israeli Nature Authority claimed that they conducted excavation works in the cemetery upon a court’s decision. It should be noted that Bab al-Rahma Cemetery is one of the most famous cemeteries in Jerusalem, which extends from al-Asbat Gate to the end of al-Aqsa Mosque walls, near the Umayyad palaces from the southern side. Bab al-Rahma Cemetrey was built on an area of 23 dunums. The Israeli government seeks to confiscate parts of the cemetery and prevent burial in parts of it to implement settlement projects in the area, including “the paths of the biblical gardens,” in addition to the air train project that connects al-Zaytoun Mount with al-Buraq Wall passing through the cemetery. At approximately 06:00 on Tuesday, 01 May 2018, Israeli Municipality bulldozers demolished a building belonging to Jamal ‘Ath ‘Eliyan in al-‘Issawiya village, northeast of occupied East Jerusalem, and displaced 17 persons, including 7 children, under the pretext of non-licensing. The building owner, Jamal ‘Eliyan, said that Special Israeli forces and Israeli Border Guard officers accompanied with Israeli Municipality crews moved into al-‘Issawiyia village and stationed at the village main entrance. He added that the Israeli forces surrounded his building, closed all streets leading to the building, and then raided it after destroying its main door. The Israeli forces informed Jamal to vacate his building in order to demolish it. Jamal stated that the demolition was carried out without a prior warning, clarifying that few months ago the Israeli Municipality imposed a fine on him estimated at NIS 250,000 and he has been paying the fine as an attempt to complete the license procedures. He added that the building was built 5 years ago and the Israeli Municipality issued a decision to demolish it after 2 years of being built, but the demolition decision was delayed and frozen several times until imposing a fine on him. He also pointed out that the building was comprised of 3 floors, the first floor used as shops belonging to Abu Isninah, Tabakhi, and Far’oun Families; and the second and third floors included 4 apartments each one built on an area of 200 square meters. The apartments belong to Mohamed Jamal ‘Eliyan with his family, Jamal ‘Eliyan with his family, Rami al-Risheq with his family, and Thair ‘Obaid with his family. ‘Elyian clarified that his lawyer headed to the Israeli Municipality and despite the judge’s approval to postpone the demolition, but the demolition supervisor claimed that delaying the demolition constitutes a dangerous to the building, so the bulldozers demolished the building. ‘Eliyan also said that the families and shops’ owners were prevented from vacating the contents and the municipality staff vacated some contents while the demolition was carried out in the largest part of the building. Moreover, clashes erupted in the village, where dozens of Palestinian young men threw stones and fireworks at the Israeli soldiers, who indiscriminately fired sound bombs and rubber bullets in the area. As a result, a journalist Wael al-Salimah was hit with a rubber bullet to the leg while covering the demolition. In addition, Mohamed Kamal ‘Eliyan was arrested and beaten by the Israeli forces. On Saturday, 28 April 2018, the Israeli Authorities notified 2 Palestinian families to seize their plot of lands in al-Khadir village, south of Bethlehem. Ahmed Salah, Coordinator of the Committee Against the Wall and Settlements in al-Khadir village, said that the Israeli authorities notified to seize 42 dunums belonging to Salah and Subaieh Families for security purposes. He also said that this measure coincided with surveying lands in Um Rukba area by the Israeli Civil Administration officers, claiming that they want to establish a large square and build a road towards Solomon’s Pools. Ahmed pointed out that the Israeli authorities lately escalated its arbitrary measures against Um Rukba area and Kherbit ‘Alia, aiming at seizing Palestinian civilians’ lands for settlement purposes. He also said that the Israeli authorities notified to demolish a retaining wall surrounding Ratib ‘Omran Salah house in Kherbit ‘Alia area in the village. At approximately 13:00 on Sunday, 29 April 2018, Israeli forces accompanied with a vehicle of the Israeli Civil Administration moved into Khilet Taha area, south of al-Tabaqa village, southwest of Dura, southwest of Hebron. The Israeli soldiers deployed in an agricultural road, which was built by the Agriculture Ministry and Dura Municipality, and ordered workers to stop their work, claiming that the area is Area (C) that is under full Israeli control according to 1995. They also claimed that the workers are working without a prior permission. The Israeli forces also confiscated a bulldozer belonging to the Agriculture Ministry before withdrawing. A 25- square-meter residential room and a shed belonging to Khalil Mahmoud Hoshieh. A shed and confiscating solar batteries and damaging water filters belonging to Ahmed ‘Isaa Yunis Abu ‘Arram. A residential room, a barrack built of tin plates, and a shed belonging to Khalil Abu ‘Arram. A residential room and solar cells and damaging water filters belonging to Mohamed Mahmoud ‘Ali al-Najjar. A residential room and confiscating solar cells belonging to Yoused Mousa Abu ‘Arram. A residential room, confiscating solar cells, and damaging water pipes belonging to Omar Mohamed al-Saree’. A barrack built of tin plates belonging to the sons of the late Mohamed Salem Abu Dayyiah al-‘Amour. At approximately 03:00 on Friday, 27 April 2018, a group of Israeli settlers from “Yitzhar “settlement, attacked stone pits area, northwest of ‘Oreef village, south of Nablus. The Israeli settlers attacked Palestinian civilians’ vehicles parked in front of the stone pits between ‘Oreef and ‘Asirat al-Qabaliyia villages. They also wrote hostile slogans against Arabs and Muslims on the vehicles and punctured with sharp tools the tiers of 2 vehicles belonging to Sakhir Company. On Friday, a group of Israeli settlers from “Yitzhar “settlement, attacked a plot of land belonging to Jamila Abed al-Rahman Shehada, from ‘Oreef village, south of Nablus. The settlers cut about 12 olive trees planted from 50 to 60 years ago with automatic saws. At approximately 10:00 on Sunday, 29 April 2018, a group of Israeli settlers from “Eli Zahav” settlement demolished Palestinian civilians’ lands belonging to Kafur al-Deek Municipality, west of Salfit, in order to expand the above-mentioned settlement. The plot of land, which was demolished, belongs to Ashraf ‘Ali Ahmed. The Israeli settlers also attacked a reporter of Ma’an News Agency, ‘Ohoud ‘Aqail al-Khafsh (38), from Merda village, north of Salif, while covering the incident. The settlers beat her to prevent her from taking photos and to confiscate her camera and cell phone. As a result, ‘Ohoud sustained bruises to her hands and legs. Full document available at the official website for the official website of the Palestinian Centre for Human Rights (PCHR).